We started experimenting with the blockchain about two years ago when we were invited to join the Blockchain Research Institute (BRI) to lead the Blockchain and IoT research. 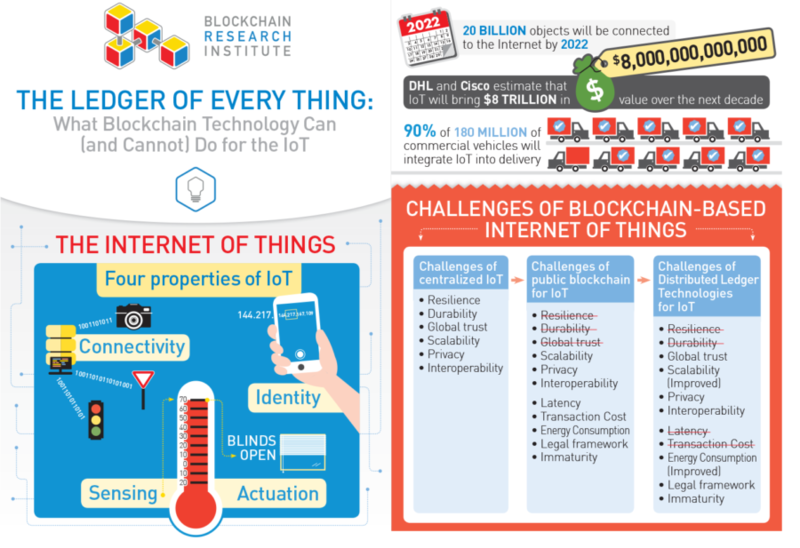 A big part of our work for the institute was to research the impact the blockchain, and more generally Distributed Ledger Technologies (DLT), will have on IoT, producing an objective research report looking at opportunities, strengths and challenges of the blockchain for IoT. Our report was published in November 2017 to the members of the BRI. However, in order to disseminate knowledge beyond members, the BRI has a rule that reports are made accessible to the world under Creative Common license six months after their initial publication. 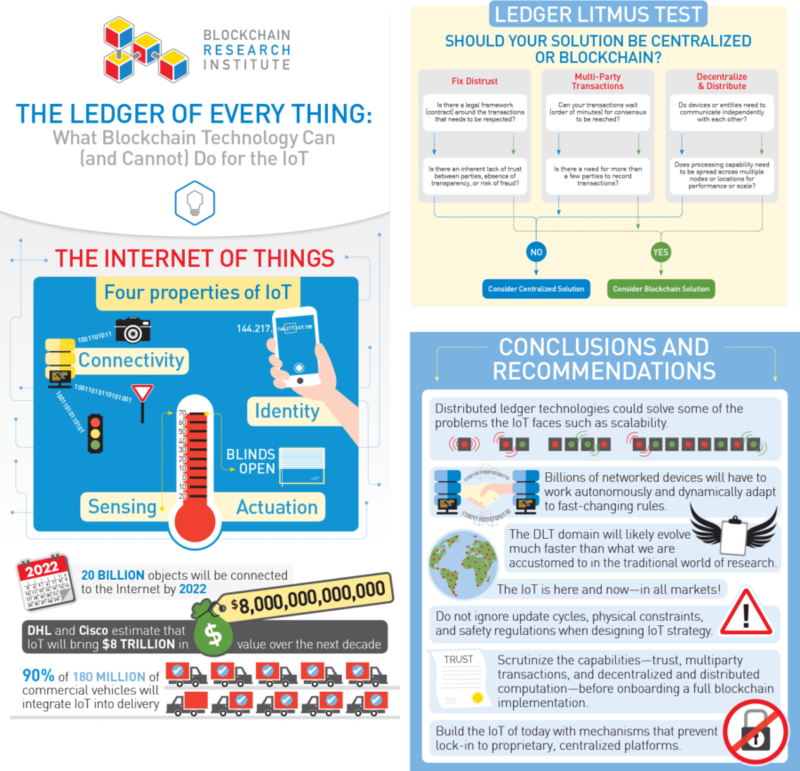 We’re now happy to provide you with a full copy of our blockchain and IoT report, which can be downloaded here. However, since the report is 38 pages long, let’s summarize the crux of it here. The report starts by providing order to the IoT chaos and defining what makes a typical IoT project: connectivity, identity, sensing and/or actuation. Resilience & Durability. Too many connected products are not built in a sustainable and durable way, leading to many IoT gadgets that will cease to work as soon as their manufacturer decides or goes out of business. Blockchains are not controlled by a single entity but by all (or some, depending on the implementation) participants in the network leading to a distribution of control that could help tackle this challenge. Global trust. How can we ensure IoT products and centralized platforms can be trusted to manage data securely and will not abuse or modify the data? Thanks to consensus mechanisms and the immutability of ledgers, blockchains are more trustworthy than centralized systems and could provide a way to verify some IoT data (e.g., transactions or identities) in a trustable manner. Interoperability. The IoT still is a fragmented world of Intranets of Things running incompatible protocols (for good and bad reasons). The blockchain could potentially help by creating global value exchange networks. However, in its current state the blockchain is as fragmented as, if not more fragmented than, the IoT space: new blockchains appear on a daily basis and are largely incompatible with one another. Scalability. How can you scale centralized platforms to billions of connected things sending trillions of updates on a daily basis? The blockchain could potentially help resolve these challenges by fostering decentralization (i.e., reducing the pressure on centralized platforms). However, today’s widespread blockchains (e.g., Bitcoin, Ethereum) scale orders of magnitude less well than centralized IoT platforms. We also discuss blockchain specific challenges such as massive energy consumption, slow throughput, lack of regulation or challenges with complying with regulations (e.g., GDPR), or relative immaturity of the solutions. Then we look at innovative solutions that could provide concrete answers to these challenges in the future. Finally, we equip the reader with a framework to understand when to use and not to use blockchain in an IoT context and propose an implementation pattern that looks into hybrid solutions: the core of the idea being to continue connecting things to the IoT via centralized platforms and start propagating some of the data to blockchains or DLT (a pattern we implemented in production with our Blockchain Integration Hub). Very few technologies have developed so rapidly and have had the impact of blockchains and DLT. The potential of these new systems is a clear hint that they will revolutionize a number of markets, including IoT. However, Rome wasn’t built in a day! The blockchain space for IoT has moved past its peak of inflated expectations and is now proceeding more carefully, realizing the lack of maturity and focusing on those challenges that we really need to solve in order to future-proof the technology. The community is now also putting effort into understanding where the technology can truly help, and where it cannot. We hope this report will provide the keys to understanding the state of the blockchain and how to start experimenting with the blockchain for the IoT and the supply chain while minimizing risks.